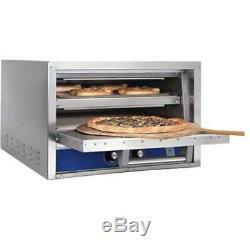 Countertop Deck Oven, Electric, Pizza Pretzel, One Compartment, 2 Decks. HearthBake Series Oven, countertop, electric, pizza/pretzel, single compartment, 3-1/4" deck height, (2) removable 20-3/4"W x 20-3/4D Cordierite hearth decks, 300Â°F - 650Â°F thermostat, 15 min. Mechanical timer, stainless steel exterior, 3,600w, UL EPH Classified, cULus, CE. Single bake chamber designed for pizza, pretzels, flat breads and bakery products baked directly on the hearth deck, screens, pans or baking sheets. 300 deg F - 650 deg F Temperature range. Electric 15-Minute timer with continuous ring alarm and manual shut-off. Two Cordierite hearth decks per oven with 3 -1/4 deck heights. Each Cordierite hearth deck measures 20-3/4" by 20-3/4". 6 Cord & plug provided with single phase models. 208v, 60hz, 1-ph, 17.3 amps. Actual images and descriptions may vary from those listed. The item "Bakers P22S Countertop Deck Oven, Electric, Pizza Pretzel, One Compartment, 2 De" is in sale since Friday, March 29, 2019. This item is in the category "Business & Industrial\Restaurant & Food Service\Commercial Kitchen Equipment\Other Comm Kitchen Equipment". The seller is "mychefstore" and is located in South Bend, Indiana.